The Air Jordan I should be a sacred shoe. Crooked Tongues was pretty much built on an enviable stash of 1985/86 OGs, made from that invincible leather that you could wear to death while your friend’s early 1990s PU soled eBay come up crumbled beneath them. It’s not a shoe we ever wanted to see get the Dunk treatment, but in the late 00s, it seemed to go that way in a blitz of doublepacks, Phat versions and crushing Lows with a scattering of triumphant Highs. Our problem was never the volume of colourways — bear in mind that there were fifteen original versions back in the day — but the quality and shape of the shoes we were seeing. Bin bag quality fake leathers and the unnecessary mid trim down ruined some childhood memories and when you’ve got wings, a Jumpman feels like a step — or jump — too far. Just as the Jordan II’s killer application was the Italian construction and bold lack of branding, the Jordan I’s selling point was the longevity of the leather used as well as the groundbreaking use of colour. It’s meant to be a shoe that wears in with games, walks and skate sessions rather than creasing artificially in fifteen minutes. What crushes us is the could-have-beens — the rivalry-themed Bulls/Celtics set from 2009 had a potentially brilliant black toe Celtics makeup that would have had us bugging as kids, but it just didn’t measure up quality wise. That could have created a powerful memory for a new set of fans, but it came off a little throwaway. Then the Banned Jordan I gave us exactly what we wanted in 2011 — no Jumpman, great packaging and a quality leather that looks better with every wear. That’s what we want in an AJ1. But while we’re seeing some great makeups, the inconsistency is bewildering — a Chicago reissue with Jumpman branding arriving alongside a nice new Knicks edition in a better leather with OG Nike branding? Huh? Then the Royal Blues arrived and were as good as the Knicks joints, but a Carolina version was made into a Mid though. Now this Rivalry pack drops and it’s mid-cut Jordans again. Damn. And even though there was an OG sample of a Lakers colourway from the mid 1980s drifting around, when that shoe came close to release in 2009 (with an unnecessary flock swoosh) the Lakers name was shunned, because they were apparently inspired by the Omega Psi Psi fraternity that MJ was a member of. We’re British and have no idea what a fraternity is, so they’ll always be Lakers Jordan Is to us. This “Rivalry” duo bases two Air Jordan I Mids on legendary NBA teams — the LA Lakers and the Detroit Pistons. Seriously — we would have killed, murdered and maimed to have a Lakers and Pistons colourway of this shoe that was the same quality and height as the Knicks version from January. How can we sit these next to the recent New York and Boston versions? Like we said, inconsistency is a problem here. The Pistons are the team that created the infamous “Jordan rules” — surely that warrants something bigger? Maybe that mid cut is Jordan’s punishment for the Bill Laimbeer elbows to the head and the foul plays by North Korean favourite, Dennis Rodman (plus his disses at Nike and Mike in the old Reebok Pump ads, before he signed to both Nike and the Bulls). That nylon toebox on the shoe just ups the sense of confusion. We kind of like these makeups for what they are, but we just wish they operated to a single standard this season to bring classic colourways to one of the ultimate shoe designs. 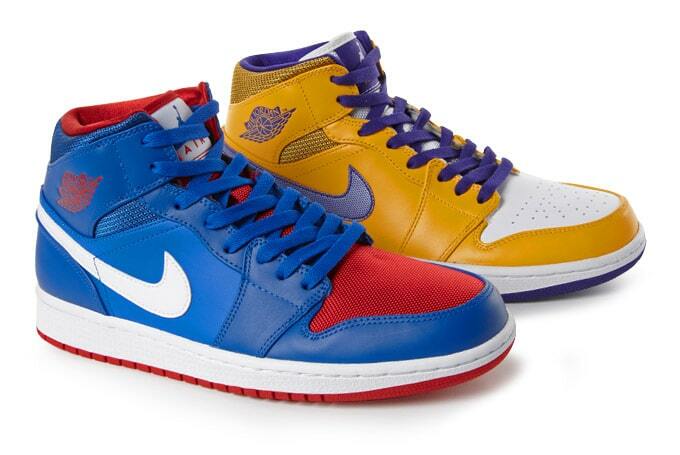 The Air Jordan I Mid Lakers and Air Jordan I Mid Pistons “Rivalry” pack is in the Crooked Tongues very soon. Nike Lunar Prestos remake an early 2000s classic.